Hello, Elite Greenhouses have been leading the way from our factory in Bolton for more than 60 years and are the go-to brand for aluminium greenhouses in the UK and across the globe. Our passion is greenhouses and we are as driven and enthusiastic today in delivering a high quality, durable and long-lasting product as we were when we started from humble beginnings in 1953. Elite have an intrinsic knowledge and continue to push the boundaries of the domestic greenhouse market and offer the customer a unique experience with products built upon strength, durability and competitive prices and offer one of the broadest range of strong and enduring greenhouse products in the industry. Our aluminium buildings can be made to any length, are available in a wide choice of colours with a huge range of accessories, are backed by a 10 year guarantee, superb in-house customer service and technical support, combined with our own fleet of heavy goods and light haulage vehicles ensuring that our products can reach all points of the UK mainland compass. Ranging from 4’ all the way to 12’ wide, in unlimited lengths, many of our most popular designs, some of which have been grower’s favourites for over 60 years. Our series of Lean-Tos have remained such popular choices for customers looking for an alternative to a traditional freestanding greenhouse. Ranging from 2’ all the way to 8’ wide, in unlimited lengths, there is sure to be a Lean-To to fit your needs. What sets Elite apart from any other greenhouse manufacturer is our ability to bespoke a greenhouse to your particular needs or requirements. There are packages available on most models. Our packages group together the essential accessories you need to get the most out of your purchase and offer great value for money with just one price to pay. We offer variety of accessories. 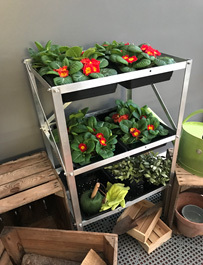 Any aluminium accessory can be powder coated to match your greenhouse. Today’s budding gardeners and enthusiasts have many avenues available to them with regards to sourcing an Elite product. We, as the manufacturer, do not sell direct to the general public, but instead supply garden centres and garden building outlets across the UK. Many dealers appear in magazines, flower shows and on the internet and offer show sites where you can actually go and view a fully constructed product. of our helpful team on 01204 791488. I've read and accept Terms and Conditions. © 2019 Elite Greenhouses Ltd. All rights reserved.